Andrew is a miracle of color as I look outside my window at brown, white, and muted gray. The blue jays don’t compare. I’ve stayed planted in my home long after I thought I’d leave. I haven’t figured out a place I’d rather be. I’m here for the long sunset views, the rich garden soil, the sense of solid place and community, the trees I’ve leaned into in the forest since 1972. Sooner rather than later, I’ll have to leave. It’s unclear how that will unfold. I promise myself to get ready and get rid of more stuff so the move is easy when it comes, but I haven’t been great at keeping that promise. For now, Vic’s mother’s continuing life at 102 makes me depend on the stability of these deep roots. Yow, Virginia is 102. Doesn’t seem fair for anyone, how Vic couldn’t make it to even 80. Good thing you do have your beautiful comforting place. 102. She could outlive us all. Yes, Andrew is quite a miracle. 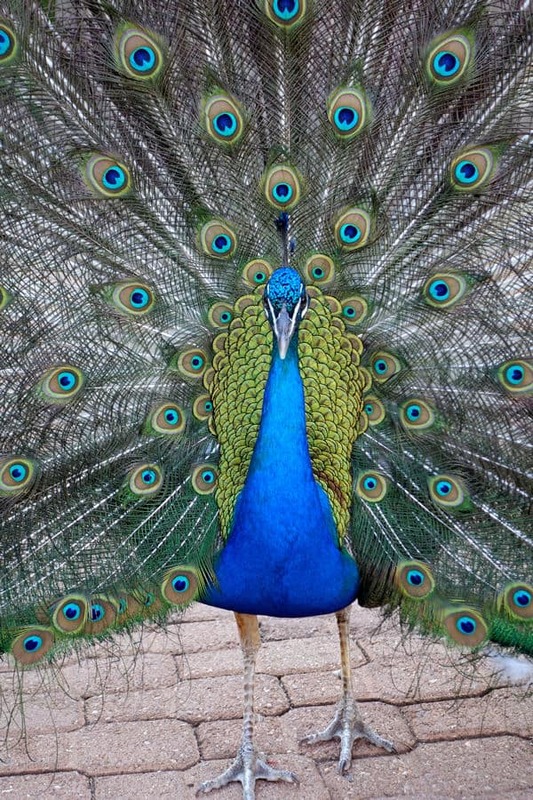 I wonder if peacocks here keep such vibrant color, especially in the winter. I know people have peacocks in Ithaca and newfield. I get to hear them but haven’t seen them. No, nothing compares. Even my photos look unreal. All of them. Miraculous, magical color. Yeah, that’s what we need in this cold, cold winter. I’m hugging my Suki. Cheers, Elaine. Does Virginia eat oatmeal every day? After my daughter, Lena, died, we moved within a year, then left the country for a year, then moved 1000 miles from “home.” This year we’ve been traveling around the US being watchful for where our next home might be. I don’t know what we are searching for or why. She is with me always in mind and sometimes she appears in a more physical way. That’s home for me. Monica, you’ve touched on one of my fears – that Marika might not follow me as I move from the house that still feels full of her. Even though I emptied out all her things (well almost all), I still often feel like she’s just upstairs in her room, or pulling up into the driveway. I wonder how it must have felt leaving home for the first time after Lena died, the home you and Lena shared. I think leaving the country for a while would be good except I could not leave my inherited dog. You were so brave to pick up and go. 1000 miles. Abroad. Still traveling and looking for a new home again. How exciting. How scary. Come check out Ithaca in your travels. I’ll wine you and dine you and put you and your spirit of Lena up. From the time I was 17 until I turned 64, I moved every one to three years–because I wanted to. I loved change and starting out again in new surroundings. New Jersey, California, Florida, Ithaca–I lived in Ithaca in the 70s and moved back in 2001. Home was whatever I created in each new place. Then, in 2005, my husband and I had a house built with a studio for me to paint in, and I’ve been here ever since with no desire to move–well, at least not enough desire to make me actually do it. As long as I can still paint, I’ll be here. I even sleep in the bed my husband died in. It’s more comforting than sad. A house in Ithaca certainly has its challenges, Robin. I too have a woodchuck that lives under my porch, and sometimes hear the scrambling of smaller creatures in the walls. I’ve temporarily stopped the smoke alarms going off in the middle of the night by putting in 5-year batteries, so I’m good for 5 years! Thanks for your report on the place you call home! Five-year batteries? Yow, Lynne, you may have just changed my life. My sleep anyway. I understand about the “more comforting than sad” thing. That’s probably what keeps me here in my house in Ithaca. And it’s nice to hear I’m not the only one providing housing for the local woodchucks. Yes, and the other small creatures – why can’t they do all that scrambling around in the daytime rather than the middle of the night, I wonder? I can’t imagine doing all that moving around that you did, but I often think of finding a small place in a warmer climate that I could move to with my little dog for a few months of the year. It seems like a baby-step towards eventually leaving home for good. But – houses have challenges, like you wrote. Who needs another bunch of challenges and woodchucks and creatures? I was so fortunate to have the coziest imaginable home, a log cabin right by a waterfall in a charming village. During all the 25 years I lived there, raising children and loving the sound of the waterfall, people envied me that place. How could I have left it? It’s still the backdrop and soundtrack for many of my dreams. For all its coziness, the log cabin had seen its share of strife and unhappiness. I would have wallowed there, perhaps. I thought taking a sabbatical would give me a new direction that I could return home with. Instead, it gave me a new life. Yes, I miss my log cabin home and all the good things that happened there, but I don’t miss the bad things. That’s the part about home that is so confounding. So many conflicting emotions. So many memories, both good and disturbing. And it’s so difficult to want to abandon those shadows of the past. Wallowing in what’s comfortable and familiar is easier than flying off into the unknown, but you were so brave and it paid off. I’m glad you return there in your dreams though. Yikes – 25 years! I look around at my home (18 years old) and wonder if there’ll ever be any other place that could warm me like this house does. Maybe a place filled with the sounds of children and laughing friends, with a lively kitchen where someone cooks exciting and comforting meals for me, and I absolutely love washing the dishes because I’m so happy. Your new life sounds beautiful, Lucy.